This colorful and musical nutcracker music box measures 1.5″ x 1.5″ x 7″ and is the perfect size for table tops, shelves, and more. 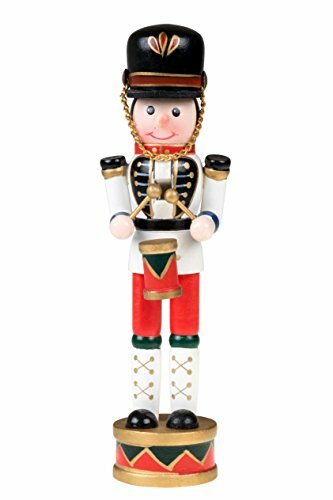 GREAT DESIGN: This small, smiling nutcracker is wearing a colorful white, blue, and red drummers uniform including a hat with a chin strap chain and carrying a drum and drum sticks. PERFECT SIZE: This colorful nutcracker measures 1.5″ x 1.5″ x 7″ and is the perfect size for table tops, shelves, and more.